Take a look at the frequently asked questions below to find answers. If you don’t find what you need, feel free to login to the Support Portal. Chrome disabled my Java plug-in. Can I still connect using SecureLink? Download and run the executable on the page. With the executable running, you will be able to connect without the need to enable the plug-in. My connect button is grayed out. How do I get access? Contact your application owner to have access enabled. What do I do if I get Authentication Failed at login? Click the “Forgot my password” link to the left of the login screen. You will be prompted to enter your email address to have a password reset email sent to you. If this does not fix the problem, contact your application owner. Many organizations have policies governing inactive or unregistered accounts. Please contact your application owner to have your account enabled. I don’t have a SecureLink login. How do I access my customers network? Click the “Vendors click here to register” link on the login screen or contact your application owner. 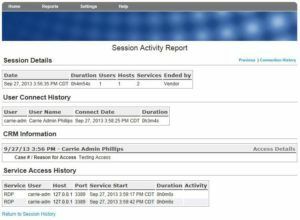 SecureLink provides the capability for vendor support reps to request a SecureLink account from the login screen. Not all customers take advantage of this feature – and some organizations will limit the feature to specific vendors. If the feature is not available, or if you get “There was a problem with your registration,” contact your application owner. What should I do if I'm getting a ClassNotFoundException when trying to connect? From your Java control panel, click the Advanced tab, disable “Use SSL 2.0 compatible clientHello format” and enable “Use TLS 1.0”. Some users may experience an error connecting after updating Java that reads “Error. Click for details”. Selecting this error brings up a detailed Application Error message that states “ClassNotFoundException” and reads “rss.sdc.SdcApplet.class” in the details. This indicates that Java is configured either not to communicate over TLS1.0 or is configured to use SSL2.0 in addition to TLS1.0. I am having trouble logging in. How do I log in? Reset your password by clicking the “Forgot my password” link to the left of the login screen. If your account is disabled or you do not have a SecureLink account, contact the application owner or your primary contact at the organization that you are trying to access. SecureLink support cannot re-enable disabled accounts or create new support rep accounts. The connect option on my application is grayed out. How do I get connected? SecureLink customers can control access to their environment by disabling remote access until needed. If your connect option is grayed out, your access has been temporarily disabled and will have to be enabled by your customer. I am having issues getting connected using SecureLink. How do I connect? You can clear the Java cache in most cases by going to the Windows Control Panel – Java- Temporary Internet Files – Delete Files. To clear the browser cache in most I.E. versions, go to Tools – Internet Options – General Tab – Temporary Internet Files Section – Delete files. To clear the browser cache in Firefox you choose Tools – Options – Privacy – Private Data Section – Settings and check the Cache option, then click OK. Or you can simply choose Tools – Clear Private Data, which will clear private settings. Disconnect from any SecureLink sessions (and preferably close all browser windows). Browse to your local user temp directory by opening an explorer window and typing “%temp%” without the quotes into the address bar. Delete the directory named SlinkSW. Confirm the directory is fully deleted (if not, a system restart may be required before attempting to delete the directory again). Retry your SecureLink connection and verify correct functionality. I’ve tried all the troubleshooting steps and am still having issues getting connected. What next? Your first option is to contact your customer’s application owner or SecureLink Administrator for assistance. Additionally, you may contact SecureLink support by sending an email to success@securelink.com. It will be helpful (and almost always help us resolve your issue more quickly) to include the logs from your connection attempts when contacting SecureLink support. The instructions below will help retrieve these logs. Depending on your operating system, you will either open the folder “Documents and Settings” or “Users” and open the directory with the same name as your Windows user account. Select all of these files at the same time by holding the Ctrl key and clicking on each file one at a time. Once all are selected, right-click any selected file and choose the following menu option “Send to -> Compressed zipped folder”. This will create a single file that contains all user diagnostic files we may need; it can now be attached to your email. What are the technical requirements for Gatekeeper? Outbound firewall access on Ports 22, 80, and 443 to the SecureLink server. Note that port 80 is required even though the Gatekeeper also uses port 443. Will I have to make any changes to my firewall configuration? The Gatekeeper requires internet access to communicate with your vendor’s SecureLink server, but there are no firewall changes necessary to enable your vendor to connect using SecureLink. If the Gatekeeper is installed on a system that does not have internet access, rules should be set on the firewall to allow SSH and HTTP access outbound directly to your vendor’s SecureLink server. Does the Gatekeeper require a dedicated workstation or server? The Gatekeeper does not need a dedicated workstation or server. Is a reboot required during installation? The Gatekeeper installation does not require a server reboot. How do I access my Gatekeeper? To access your Gatekeeper you will need to navigate to your vendor’s SecureLink server, with your vendor provided URL, and log-in with your provided credentials. The URL and credentials will automatically be emailed to you when your vendor creates your Gatekeeper account. Local access to the Gatekeeper is also available and provides limited administrative functionality. The Gatekeeper can be accessed locally from the Windows start menu under All Programs > SecureLink > SecureLink Gatekeeper. You can also access the Gatekeeper from your preferred browser by typing http://127.0.0.1:4680 in the address bar. Gatekeeper Admin: How do I enable access for my vendor? Can I change Notification emails? Access notification emails are controlled by each individual Gatekeeper user. Each Gatekeeper you have access to will be listed under My Account with the ability to toggle notifications on or off for that Gatekeeper. To send notification emails to additional users, navigate to My Gatekeepers > Users and edit the user you wish to receive notification emails. How do I store credentials? The Gatekeeper provides you with the ability to store, mask, and pass login credentials for your vendors. Credentials can be stored for RDP, SSH, and Telnet access. Select RDP/SSH/Telnet Credentials from the Settings menu. Enter the required information on the corresponding credentials screen. Once the credentials have been added, they will need to be associated with the appropriate server or host. Select Vendor Privilege Settings from the Settings menu. Click Add New Host and enter the host or IP of the devices you would like to enable access to your vendor. 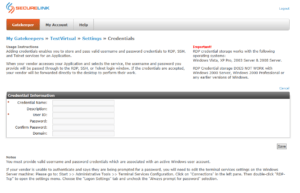 Add the RDP or SSH service the vendor requires and attach the created credential to this service. What audit information is stored by the Gatekeeper? The Gatekeeper stores information regarding who has connected, where they connected from, when they connected, what servers were accessed, which ports and services were used for access, and what files were accessed. The Gatekeeper can also record RDP and Telnet sessions. To access the Gatekeeper reports select Report from the Gatekeeper menu. Where can I learn more about more about my Gatekeeper installation? The SecureLink Gatekeeper info site is a great place to learn about your Gatekeeper installation.